The problem with finding yourself on the losing end of a fight in a game of Fortnite is that it’s very difficult to get yourself out of trouble. Sure, occasionally you might manage to sneak away from another player, but most of the time any attempt to run from a fight will be met with a hail of bullets and a quick trip back to the battle bus. If you’ve played Fortnite this season, you’ll have seen the Rifts dotted around the map, allowing players to be transported into the sky to glide away at their leisure. 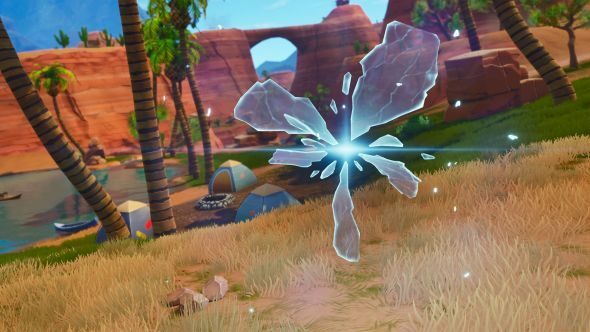 While the Rifts seem to be closing, they could soon be replaced by the new item, which seems to be something of a cross between the strange portals and another Fortnite item, the Port-a-Fort, which was introduced earlier this year. The Rift-To-Go will seemingly work in the same way as a Rift, allowing you to “teleport above your current location and glide down.” From what you can see in the client, it looks like you’ll through the item like a grenade, opening up a portal on the ground where it impacts. Alternatively, you might just crush the item, kind of like a mushroom or hop-rock, in order to instantly fly into the sky. The Rift-To-Go will most likely arrive tomorrow, with the launch of Fortnite patch 5.3, so keep a look out for them throughout the rest of the week.